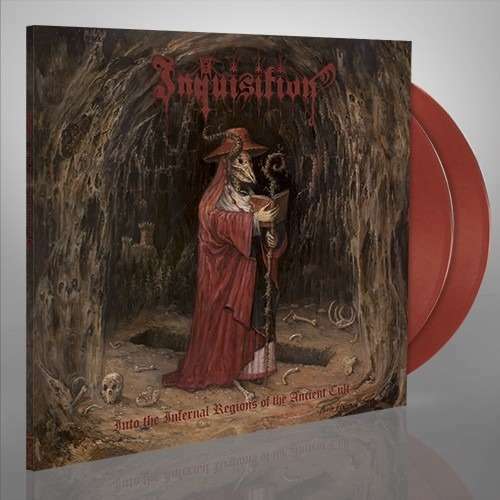 Gold & solid red mixed 12" double vinyl (45 rpm) in deluxe gatefold with red hot foil limited to 500 copies worldwide. Cult black metal act INQUISITION exploded from the underground with 2013's full-length 'Obscure Verses For The Multiverse'. Prior to the release of this critically-acclaimed masterpiece, the American duo had unleashed five other albums that all contributed in establishing INQUISITION as a rising black star on the extreme metal scene. Originally published in 1998 and long out of print outside of North America, ‘Into the Infernal Regions of the Ancient Cult' already featured the band's trademark chainsaw riffs and ominous vocals croaking odes to the infinite and satanic alike. Foreshadowing INQUISITION's arrival as the new kings of darkness and now adorned with brand new cover art designed Paolo Girardi, the album's ten paeans to the occult are at once hostile, hypnotic, and bombastic.